Reuters thought it was one billion. The Wall Street Journal said experts estimated it was two billion. Sky News thought it was three billion. McClatchy thought it was four billion. And Bloomberg played safe by saying that it thought it was “probably the largest live television audience in history”. They were, of course, talking about the number of people who saw the opening ceremony of the Beijing Olympics. Seldom, if ever, has there been such an audiovisual spectacular. Unsurprisingly, a key role was played by the two dominant large screen technologies: projection and LED displays. And, from talking to the industry, it seems that what we saw in the Bird’s Nest this past summer was representative of a large-screen market that is thriving throughout Asia. Dave Bateman continues. “If you compare the Asian market with the European and North American markets, there are definitely differences in market scale—but at a project level, those projects being developed around Asia are as large and spectacular as any around the world,” he says. “China has installed some impressive architectural screens. As far as product acceptance is concerned, though, I would say that Asia is still the main market for low-cost screens manufactured in China, while the North American market is generally dominated by the top brand names. In Europe I believe there has been less acceptance of low-cost China product with concerns over reliability and after sales service. C C Lam sees a similar phenomenon. “Many buildings or brands like to install large LED screens on their store or building front to attract customers and to increase advertising revenue,” he says. 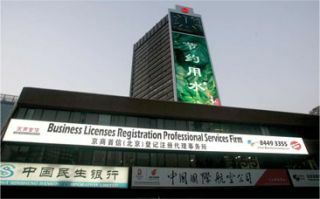 “The Wuhan Gongyi Building in China and Hong Kong’s Olympian City II shopping mall are excellent examples of this.” Lam goes on to note other ‘hot’ applications for large-scale displays, including sporting venues and casinos such as Wynn Casino and Starworld Hotel and Casino in Macau, as well as the increasing number of major events, conferences and trade shows that are taking place throughout the region. This emphasis on architectural displays is leading to innovations in both the technology and the applications to which it’s put. Gone are the day when the sole purpose of an LED wall was to act as a giant TV set. Dave Bateman describes DisplayLED’s flexible digiFLEX video skin, its digiPIX displays that are designed to be mounted onto surfaces in large pitch configurations, and its Mirage semi-transparent screens. C C Lam talks about Lighthouse’s Bar, Mesh and Tile non-panel LED products which, he says, offer light weight, transparency, weather resistance, high brightness and almost unlimited installation options. Barco’s Richard Marples focuses on the applications— such as the use of Barco’s MiStrip LED modules by Japanese rock bad B’z to create the impression of a magic carpet flying above the group on stage, or by Hong Kong rental company AV Promotions to create a 13 meter high by 3.5 meter diameter Coke bottle. Watanabe goes on to point out that the LED screens used at the Beijing Olympics came from major brands, rather than indigenous manufacturers. “We feel that, having now seen the difference in picture quality in screens from overseas suppliers, the Chinese market will be less willing to accept the poor performance and reliability problems found in some of its cheaper domestic products,” he says. Richard Marples agrees—seeing impetus not just for growth, but for greater market maturity. “Yes. I believe that many events will simulate or emulate some of the components of the Olympics ceremonies, albeit on a smaller scale,” he says. “I also believe that the scale and sophistication of the audiovisual effects, and the technical challenges that had to be overcome to produce them, will cause prospective customers to think about the total value proposition— including experience, expertise and reliability—offered by suppliers, and to focus less on purchase price.” His colleagues in the large-scale displays industry would doubtless say ‘amen’ to that.